We offer up some how-to advice on making your alfresco spring gathering the talk of the town. The festive combination of budding trees, bright flowers and cool weather create a perfect backdrop for spring dining. 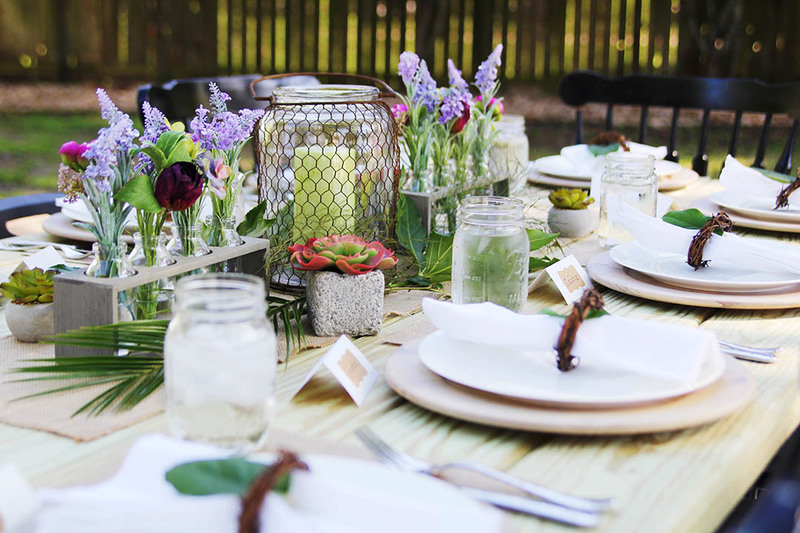 Whether you’re simply wanting a change of pace from your family’s trusty kitchen table or are planning to celebrate the rich relationships between some of your closest friends and their mothers this Mother’s Day, here’s how to host a backyard garden party that is stylish yet simple, relaxed and ripe for candid conversation. With life in full bloom around us, raise your glass—and salad fork—to a day of laughter, eating, enjoying humorous anecdotes and creating fond memories spent together. I love to eat outside. There is something magical about the fresh air, the sounds of birds and the feel of the breeze whishing around me that make outdoor parties feel comfortable. Atmosphere is a huge component to any party and, particularly with outdoor gatherings, I focus on having plenty of seating and lighting. >Simplified: Bring an indoor table and chairs outside if you don’t have an outdoor table. Indoor furniture for an outdoor party makes your backyard feel like an extension of the house. >Next level: Use an unexpected theme, like a classic movie, and do some research to find out what foods, drinks and decorations came from that time or place. You don’t have to have a garden to have a garden party. Fresh-cut flowers, potted herbs and greenery placed around the table make for a beautiful setting. I also like to use natural elements like leaves and vines, which serve as creative, makeshift twists on place cards and napkin rings. >Simplified: Buy small potted herbs for the centerpiece and then let each guest take one home as a party favor. >Next level: Easily add a garden to your space by using a half-barrel from a local hardware store. Plant herbs that can be used in the meal (rosemary, thyme, basil) for a true garden-to-table experience. Mix 4 ounces tequila, 1/2 cup lime juice, 2/3 cup water, 4 tablespoons agave nectar and the juice of 1 orange until all ingredients are combined. Add ice and 1/2 cup strawberry slices to four glasses and pour the mixture over them. Garnish with a strawberry slice and lime wedge. >Simplified: Ask your guests to each bring their favorite salad to share. This way, everyone gets to contribute and can leave with new favorite recipes. >Next level: Consider using colorful, seasonal ingredients that will elevate your salads and make them more memorable. Some of my favorites include goat cheese, slow-roasted veggies and fresh fruit.